I drop the wordpress and gain a domain. I have been thinking for awhile that it was time to buy my own domain. Because these things confuse me a little, I got Man Piece to investigate. About half an hour ago he said some stuff and basically told me what I had to do with wordpress to have my own domain, but keep everything the same. So the only thing that has changed is instead of seeing lisarapley.wordpress.com in the url, you will now see lisarapley.com. 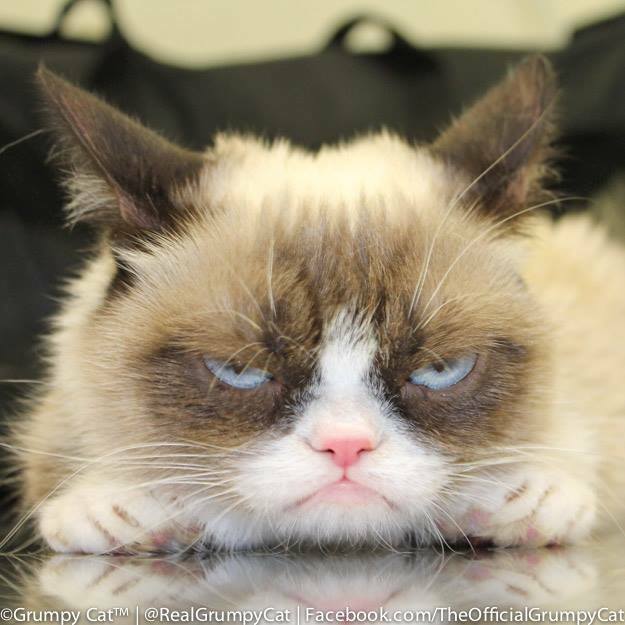 Everything is still where it was and I am told everything will just redirect from the old wordpress domain. You don’t even have to update your RSS feeds. How snazzy. And considering the amount of money I spend on clothes in a year, the $18 cost for registration was nothing. Also, as this blog celebrated its fourth birthday back in August, which I totally missed, it was definitely time to grow up a bit. So here’s to more happy blogging! Ok, so I’m like a week late in doing this post. Seriously, I’ve had the tabs open of what dresses I liked all week. This isn’t a best dressed and worst dressed post, unlike last year. These are just the dresses that I liked. Some appeared on best dressed lists and some appeared on worst dressed lists, but that is all relative to your taste and style. Nina Dobrev in a Naeem Khan gown – prints are totally the ‘in’ thing right now. Jennifer Garner in Gucci – the colour is just amazing. Amy Adams in Oscar de la Renta, which she apparently helped to design. LOVING IT. JLaw in Dior, naturally. Absolutely love this dress. JLaw is flawless. Except, yanno… when she fell over in it. Zoe Saldana in Alexis Mabille – I love the semi-ombre look and how it is short on one side and a train on the other. Catherine Zeta Jones in Zuhair Murad. Love the gold. Naomi Watts in Armani. The neck detail is gorgeous. Kristen Stewart in Reem Acra. I really love this dress, even though so many said they didn’t. She does need to do something with her hair though. The unbrushed loose look with an evening gown just does not work. Nicole Kidman in L’Wren Scott. The gold on black just stands out. I wasn’t going to mention any dresses that I didn’t like, but there was one that I just had to mention. Melissa McCarthy in David Meister. I love Melissa McCarthy, she is absolutely superb, but this dress does her absolutely no favours. Firstly, why would David Meister think this dress was actually nice? It’s ghastly. Secondly, why would MC’s stylist dress her in such a thing? Gurrrl, whoever helped dress you, send them packing, if not for the choice in dress, but for the hair. 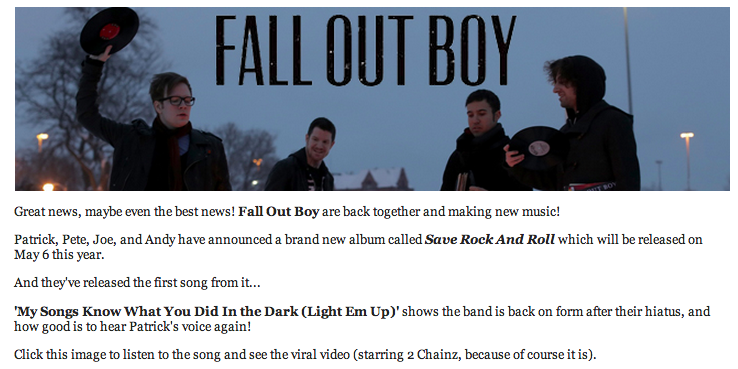 Fall Out Boy are back and I’m so freaking excited! This morning I woke to a wonderous email. 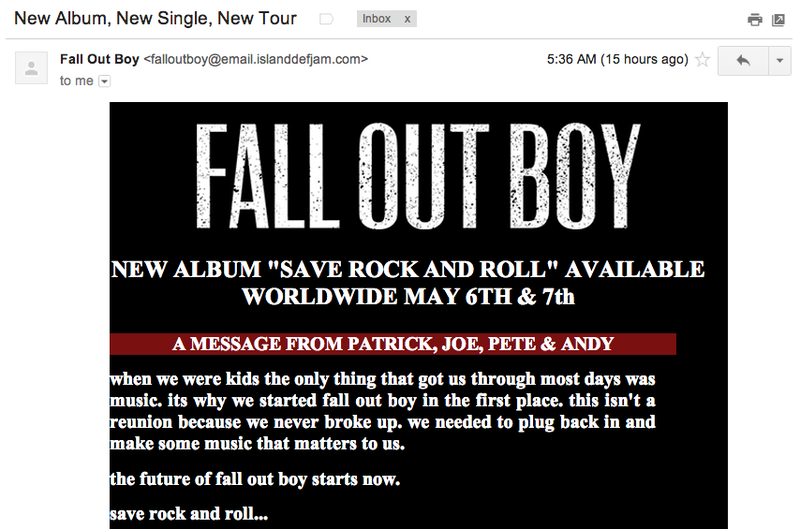 An email detailing the return of Fall Out Boy. OH HAPPY DAYS. Fall Out Boy have been on hiatus for the past three years – they adamantly deny that they ever broke up – and now finally, with having denied their come back as well, have surprised* us all quite suddenly with a new single, new tour dates and the announcement of a new album. So yes, they’re back and the new album ‘Save Rock and Roll’ is out May 6. In addition to this announcement, the band have released their new single from the album – My Songs Know What You Did In The Dark (Light Em Up). And the best part about all of this is that they are doing a tour with a Sydney date – March 25! I will be there, hopefully, if I can get tickets and I’m going to bloody well try with all my life. 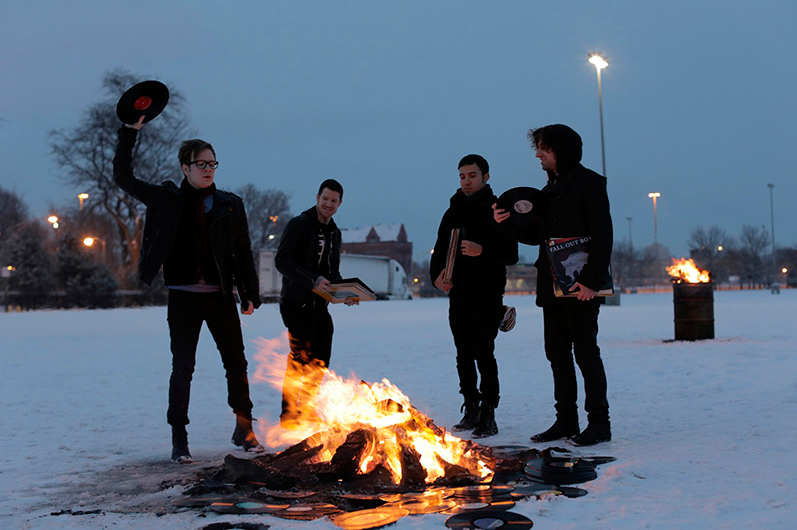 Welcome back Fall Out Boy, I look forward to the gig, the album release and whatever else you have to come. 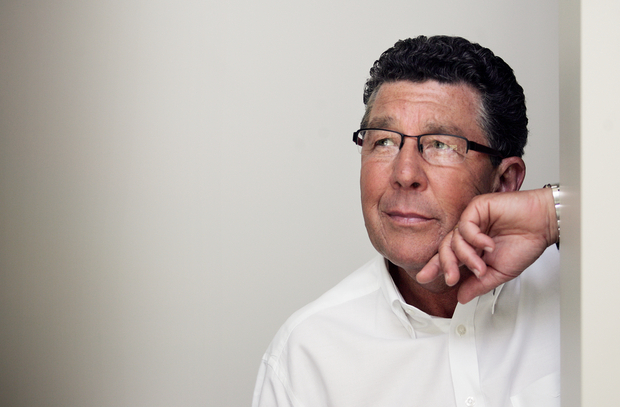 Yesterday morning New Zealand woke to the news Sir Paul Holmes had passed away. Sir Paul was one of the greatest journalists New Zealand has ever had and helped change the face of broadcasting in the country. His achievements have been well documented in the media over the past weeks. He will be missed, he will not be forgotten, he has influenced every single journalist in New Zealand and will probably continue to do so. I remember watching Holmes at 7pm while growing up and I remember reading his weekly column in the Hawke’s Bay Today/New Zealand Herald. I remember one point during my internship at the Hawke’s Bay Today those in the newsroom talking highly of him. At the time he had filed his column for the weekend with several days to spare – unusual for a journalist, usually we take every second possible when meeting a deadline. But most of all, I remember him speaking at the opening of the new technology block at Karamu High School, my high school. So, goodnight Sir Paul, the next generation is here to carry on your legacy. I haven’t done a personal update in a while, so I thought it was time. As many of you would have deduced by now, Man Piece and I did not end up in Melbourne, but instead moved to Sydney. Man Piece got a job offer so we decided to just go. We’ve since found a nice little inner-city apartment and even I have found a job. I thought it would take me awhile, but I found a one fairly quickly, which was quite surprising. But I thought I would catch you up on what I have been up to for the last two months – Man Piece and I have been here for 10 weeks now. And I decided to be a little creative. I have recently found some really good picture framing apps on my phone, a lot better than the ones I have used before.